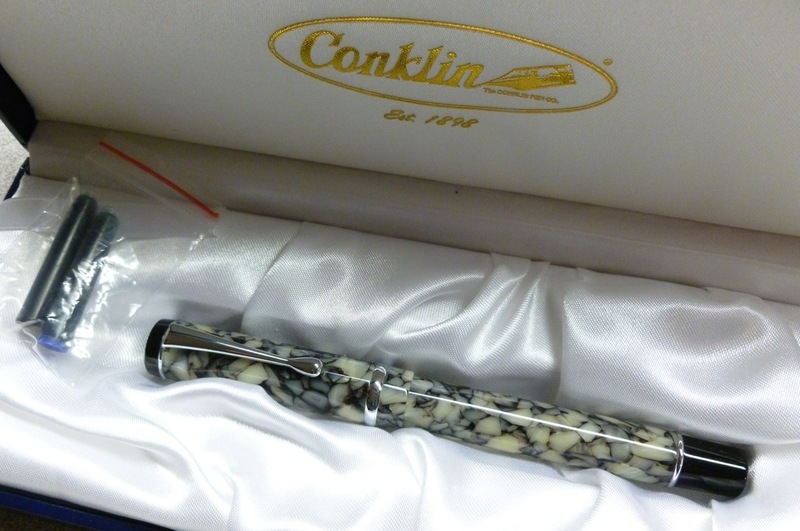 Many thanks to Ron, at Pen Chalet, for sending along this Conklin Duragraph fountain pen. 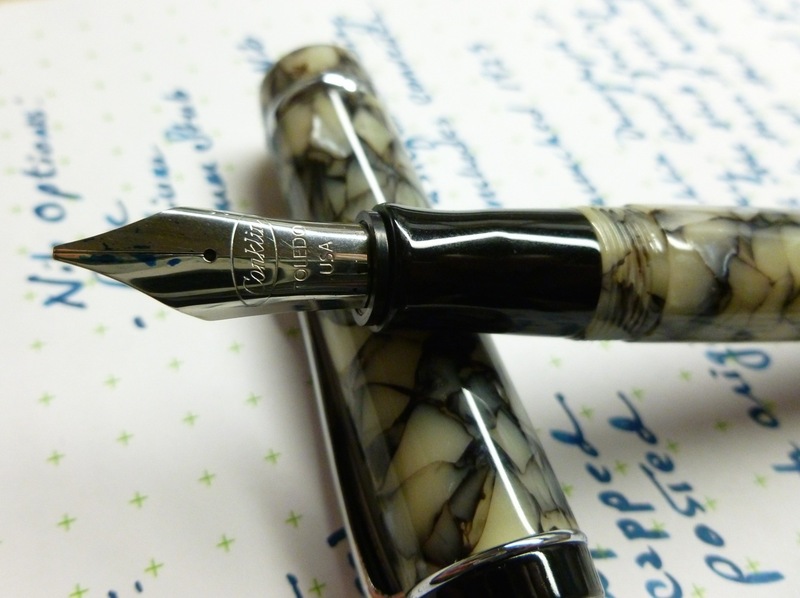 I was not compensated for my review, and this post reflects my experiences with the pen. There are no affiliate links in this post. The Conklin box is a little coffinesque, but it holds a very nice pen. I filled my Cracked Ice version with Pilot Iroshizuku tsuki-yo, and set pen to paper. 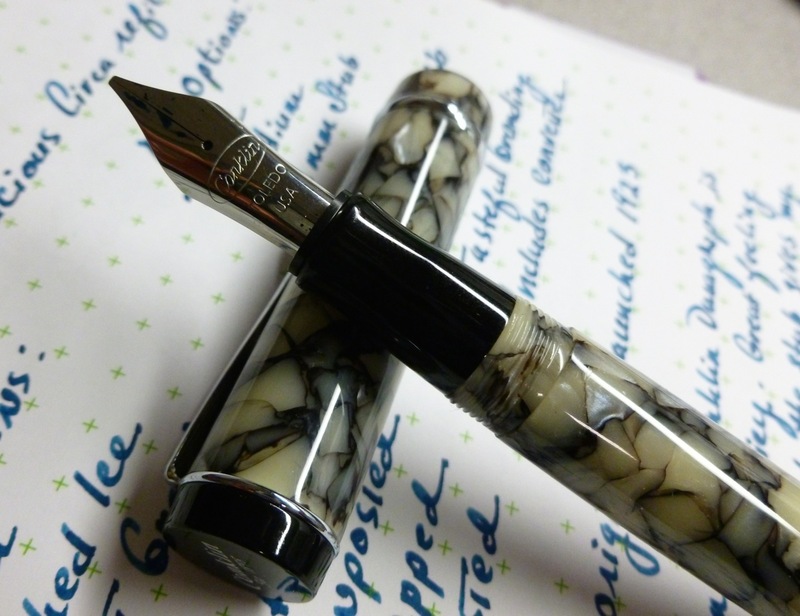 The stub nib on this Conklin Duragraph is smooth and plenty juicy, but not overly so. My other Conklin pens have equally smooth nibs (that’s 4 for 4), so I’ve either been lucky or nib QC is quite good. Flow is perfect— neither too dry or too wet. Available in Amber, Cracked Ice, and Forest Green versions, I was initially drawn to the Amber version (fall colors are kind of my “thing”), but decided to branch out a bit and chose the Cracked Ice resin. 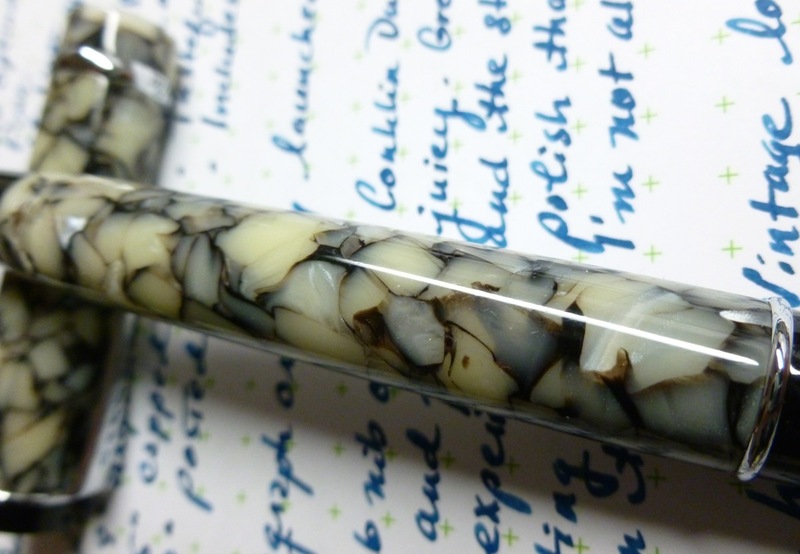 I haven’t seen the other finishes in person, and I’m sure they’re great looking, but, to me, the Cracked Ice resin accentuates the vintage roots of the pen. It looks like a pen my grandfather would’ve used— sort of understated, but still interesting— like a pen made from crushed sea shells. The stainless steel nib is available in fine, medium, and this 1.1 mm stub. Though not really suitable for me as a daily writer, the stub gives my handwriting more flair than it normally has, even though I’m not particularly proficient with it. I’ve never experienced a hard start or any skipping. I’m really pleased with the flow and the feel of the writing experience. It’s silky smooth. This is a pen that’s meant to be used unposted. Though it’s possible to post the cap, it doesn’t post securely at all (the cap could/would definitely wiggle off), AND extends the pen to an unwieldy feeling 6.9″ (175 mm). Capped, the pen measures 5.9″ (140 mm). Unposted, it measures 4.9″ (124 mm), which feels fine in my hand, but might be a bit short if your hands are very large. The concave grip gives my fingers the perfect resting place for writing and doodling. The capped pen weighs 26 grams— sort of a nice “middle-ground” weight. I have NO complaints with anything about the look or the feel of this pen. This newly released Conklin Duragraph stays true to its vintage roots without the price tag that can come with a vintage pen. Listing for $55, and available from Pen Chalet for only $44, this is a pen that’s hard to resist. I really can’t get over the price. I suspect that the Amber one is in my future, maybe with a medium nib. 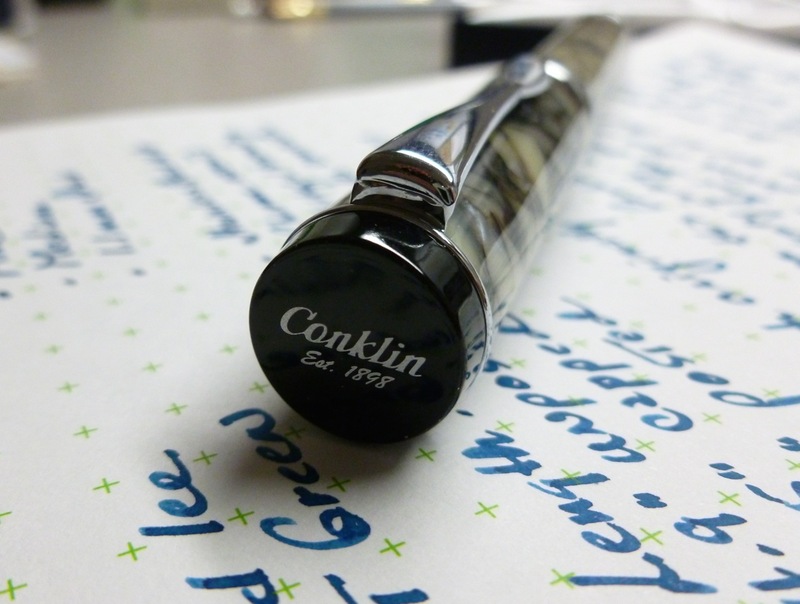 The Conklin Duragraph is a pen that’s easy to fall for. The cartridge/converter set-up means that it’s easy to maintain, the resins are gorgeous, and the nibs smooth. And that price? What’s not to love?! 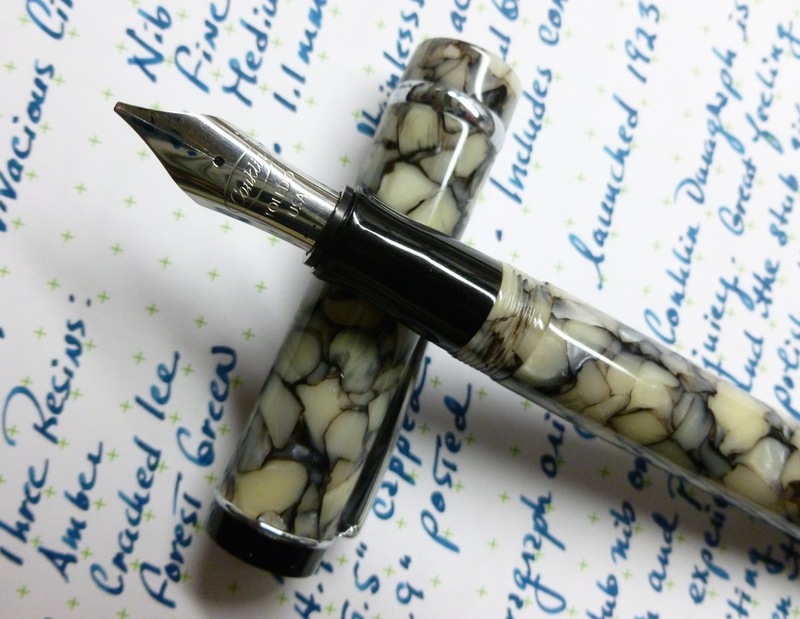 Check out the Conklin Duragraph line at Pen Chalet HERE. You really can’t go wrong.